President of the Vietnam Fatherland Front (VFF) Central Committee Nguyen Thien Nhan chaired a Vietnam-India Business Forum in New Delhi on March 21 during his official visit to India. The event was jointly organised by the Vietnam Chamber of Commerce and Industry (VCCI) and the Confederation of Indian Industry (CII) to provide a chance for the business circles of the two countries to further their partnership. 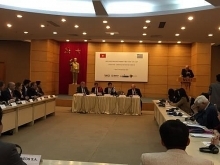 Addressing the event, the VFF leader emphasized Vietnam’s success in shifting from a centralized economy to a market economy as a result of the Doi Moi (renovation) policy launched in 1986. He noted that the country has seen an average growth of 6.7 percent annually during the past 28 years, 1.36 times higher than that of other newly-emerged and developing countries, and 2.8 times the rate in developed economies, adding that from a country facing food shortage, Vietnam has become one of the world largest exporters of farm produce. He highlighted that India has become one of the top 10 largest trade partners of Vietnam, with two-way trade rose 77 times in the past decade, hitting 5.6 billion USD last year from only 72.1 million USD in 1995. 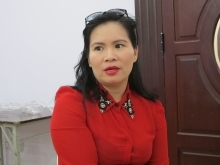 Nhan urged businesses of both countries to seek more partnership opportunities to tap the still great potential and further boost bilateral economic-trade ties. According to Sanjay Bhattacharyya, head of the South Division at the Foreign Ministry and Sudhr Kapur, CII Chairman, India hopes that many opportunities will open up for both sides once India and ASEAN realise the free trade agreement on service and investment. Vietnam is an attractive destination for Indian investors, they said, noting that in 2013, India has 77 projects worth 254 million USD in Vietnam, while Vietnam also invested 24 million USD in projects in India . Bhattacharyya said after ASEAN and India signed the FTA in goods, trade between India and Vietnam had increased by 4 times. The figure is expected to reach 20 billion USD in 2020, he stated. India is keen on investing in infrastructure and information technology in Vietnam , he declared, adding that finance-banking is also a potential cooperation area. 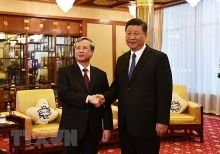 Meanwhile, Kapur said after an economic corridor between Mekong Sub-region and India is set up to link India’s northeastern localities with Vietnam, economic and trade ties between the two countries will be boosted. He proposed that both sides should work more closely in human resources training and share experience in various areas, including agriculture, while enhancing cooperation in production and export to a third country.